For the first time in three years, I ordered prints of our most recent family photos, put together a quick recap of our year, and actually mailed out Christmas cards to family and friends. As much as I loved putting together this peek into our family, I actually started working on Christmas cards the day after Christmas last year. What do you mean you started last Christmas?? The Christmas cards we started on last Christmas were not cards for family or friends. The Christmas cards we started on last Christmas were for people we may never meet. For the past few years, we have worked on Christmas cards for Compassion's unsponsored children. During the year, we get together with sponsors from our church family to work on adding Bible verses and signing lots of Christmas cards. Some of the kids like to make homemade cards and we love to send those along too. Want to participate with your family next year? Stock up on Christmas cards while they are on sale this week, or start collecting supplies to make cards through the year. Set aside time to meet up with other sponsors to work on the cards through the year. Collect the cards until next fall when we receive instructions on when and to whom to mail the Christmas cards. Can I issue you a challenge? 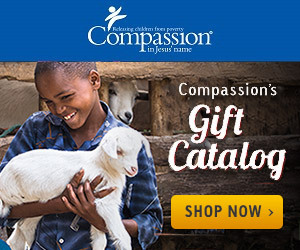 In 2015, the Child Correspondence department at Compassion sent out 20,001 cards to unsponsored children for Christmas. This was a record breaking number! You can help make next year another record breaking year! By planning ahead for next Christmas, you can brighten a child's day with a special reminder that God loves them on Christmas Day.